Born and educated in New England, John Matassa received more than thirty awards and honors for his work including the prestigious William Paige Traveling Fellowship, from the Boston Museum of Fine Arts. John lived and worked in Delaware for thirty years, where his studios in Wilmington and on he Indian River bay afforded him the opportunity to research ships built in the area and portray them in a natural marine environment. "My paintings are a combination of a fascination with old ships combined with my love of color and paint on canvas," John once said. "Having studios on the water and near the former great shipbuilders of Wilmington is perfect for my work." 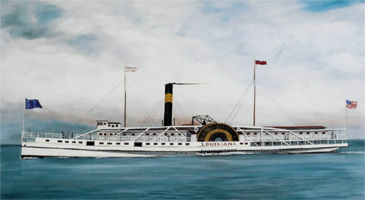 John's paintings are in several hundred public and private collections and he is listed in "Who's Who in American Art."